Large red flower with glossy leaves. 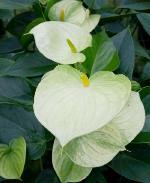 Beautiful long-lasting interior plant with heart-shaped foliage. Very large red flower with large leaves. 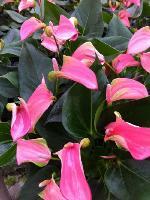 Beautiful long-lasting interior plant with heart-shaped foliage. Medium pink folded flower with green splashed edges. 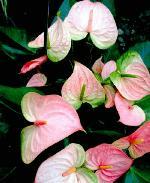 Beautiful long-lasting interior plant with heart-shaped foliage. Large pink and green flower with erect leaves. 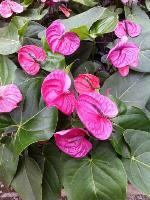 Beautiful long-lasting interior plant with heart-shaped foliage. 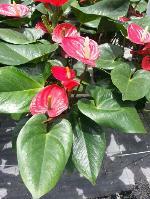 Rock-candy coloured Anthurium. Suitable for different pot sizes. Large purple flower with large shiny leaves. 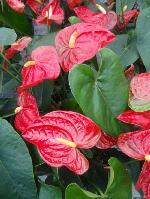 Beautiful long-lasting interior plant with heart-shaped foliage. An Anthurium with a unique yellow colour. Has medium sized flowers. 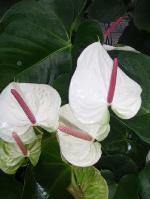 Large white flower spath with pink spadix and glossy leaves. 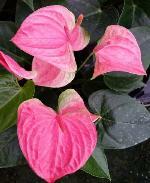 Beautiful long-lasting interior plant with heart-shaped foliage.